Take the Challenge… Run 4 Half Marathons or MORE! It’s YOUR challenge! Choose a GOAL! Stay MOTIVATED! 52.4 4 Half Marathons YOU GOT THIS! 65.5 5 Half Marathons YOU ARE HALF CRAZY! 78.6 6 Half Marathons BEAST MODE!!! Mail in registration means you save money… No processing fees! Price includes all registration costs and swag from each individual race. 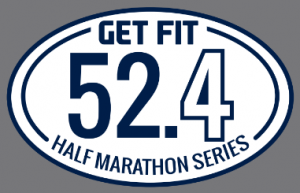 PLUS you get the GET FIT 52.4 SERIES SWAG !!! Or the 65.5 SERIES SWAG or the 78.6 SERIES SWAG!!! We are putting together some amazing swag to reward you for your effort and accomplishment! Those items will be posted ASAP. Choose from the 6 Willow Running events below. No substitutions this year. REGISTRATION: To register for the 52,4, 65.5 or 78.6 HALF MARATHON SERIES download the application.